A video-based software service from Prism Skylabs can help the business owner use cameras for business intelligence. "Prism is a cloud service that takes [surveillance] cameras inside stores and turns them into an analytical technology," said San Francisco-based Prism CEO and founder Steve Russell, in a report from the National Retail Federation. "It will give management a way to look into stores without having to physically visit them." Their product can count people and measure crowd size in any area; understand movement, activity, and product interaction; and help model customer movement. Russell said that the retail sector as a whole uploads two million hours of visual data per minute, according to the NRF report. Those big numbers carry some obstacles to data usage. Russell said one obstacle is the sheer size of the files. Another, he said, is the privacy issue; generally speaking, you can't use data that shows recognizable individuals. Here is the Prism Skylabs twist: What if those CCTV cameras could conceal rather than show you sorting through shirts at the mall? The Prism Sklylabs solution removes anything moving from imagery where only an authorized person can view what is concealed in the tape. New Scientist had the report last week, showing how their technology can transform a busy city into a ghost town. Their target user is the business owner: "Tap, swipe, and zoom your way around stunning, privacy-protected images of your business," is their message. "We're the only platform in the world that's built privacy protection into its core processing engine. At the same time visual quality is enhanced, people and objects are separated for removal from view," according to the company. 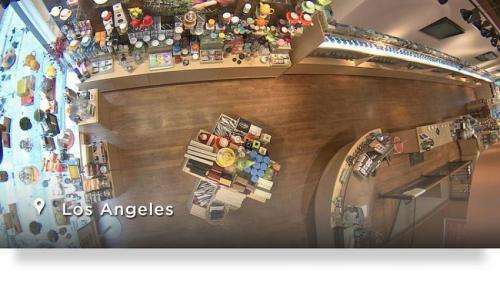 Prism Skylabs uses a patented technology to remove pictures of people from the video, said the National Retail Federation report. "And computational imaging—which is basically what a phone does when you take a picture with it—can smooth the output of the average surveillance camera and create a useful, high-quality image." Chris Baraniuk in New Scientist discussed how it works: "The setup uses a machine learning algorithm to identify movement belonging to foreground elements, like a person walking across the camera's field of view. The software recognizes the stationary background and can then paint over foreground objects to neatly hide human activity. The cameras themselves carry out all the analysis and processing so that no sensitive data has to necessarily be transmitted across the internet, where it may be vulnerable to interception." Earlier this month, Prism announced it was opening its platform to device manufacturers. The announcement said, "There's been tremendous advancements in video sensors in recent years, and by adding Prism directly to these devices, they're open to a whole new range of applications and functionality." Wow. Now staff in stores won't be able to identify the shoplifters. Another win for crime. Great job. Ohh great plan not sending the "sensitive" data out too. That means the shoplifters only need to remove the local units and can rest in comfort knowing their pictures haven't been posted out. "If there are staff watching CCTV that shouldn't be, stop them and if there is CCTV where there shouldn't be, remove it."